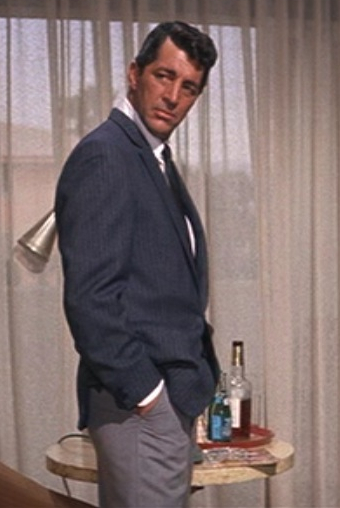 Dean Martin as Sam Harmon in Ocean’s Eleven (1960). Tomorrow would’ve been the 97th birthday of a true icon from a past era… Dean Martin. In the film that helped cement the Rat Pack’s place in history, Frank Sinatra and Dean Martin play two old army pals who team up with nine fellow ex-commandos to take down five Las Vegas casinos on New Year’s Eve. Ocean’s Eleven is mostly an excuse for these actors to get together to drink, smoke, chase dames, and sing, but that’s all we really want to see them do anyway. Dean plays his naturally calm, cool, and collected self in the guise of “Sam Harmon”, a lounge singer who reluctantly joins the plan. 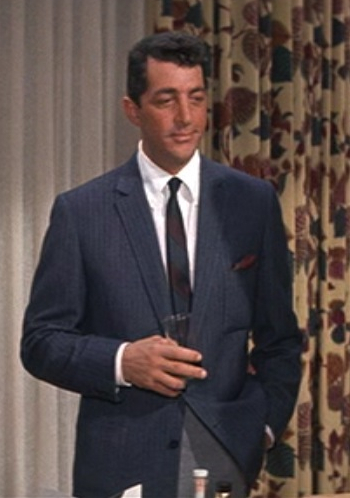 Since it is Dean Martin, after all, he wears a black tuxedo for the heist itself, but he spends the majority of the film leisurely taking a drink in a casual sport coat and slacks. There are right ways and wrong ways to wear a dark blue sport jacket and slacks. This is Dean’s way, and for a cool day where you want to look simultaneously classy and casual, it’s the best way. In this scene, heist plotters Danny (Sinatra) and Sam (Dino) are meeting with Duke Santos (Cesar Romero), a suave ex-gangster who plans on brokering a deal between the thieves and the mob-backed casino owners. In his casual sport coat and tie, Dean nicely bridges the very casual cardigan worn by Sinatra and the gray business suit worn by Romero. Dean’s flannel sport coat in this brief scene is a blue version of the brown striped sport coat worn earlier in the film. They’re exactly the same, right down to the details, the fit, and the tonal stripe, except that this jacket has a blue-gray ground and dark blue tonal stripes. Both were likely tailored for Martin by Sy Devore, who charged $200 for his custom sport coats. There are three patch pockets, with two large hip pockets and one breast pocket, accented with a burgundy silk handkerchief that puffs out charmingly lazily over the top. The sport coat has slim notch lapels and a single-breasted front with a low 2-button stance. Dean buttons only the top button, leaving it fastened while both sitting and standing. It has slightly padded shoulders and hangs nicely on Dino’s athletic frame. There are two short vents in the rear, keeping him cool while wearing a flannel jacket in the desert. While many men immediately pair khakis or light brown slacks with a dark blue blazer, Dean wears a pair of light gray casual trousers. Some deride the look as too similar to a security guard’s uniform, but Dean’s unique jacket and colorful flairs throughout keep the look refreshing yet classic. The light gray trousers rise high on his waist and fit generously down to the plain-hemmed bottoms without being baggy. They have slanted side pockets, which Dean’s hands use to great effect in looking cool, and a jetted button-through pocket on the right rear side. Dean wears one of his usual white button-down shirts. The lightweight material and loose fit keep it voluminous and comfortable in warm weather without bunching up under the jacket. The button-down collar is more appropriate here than when he wears them with his tuxedo since this is a far more casual, relaxed look. The shirt also has a front placket and buttoned cuffs. The large shirt collar also contrasts agaisnt the small and tight tie knot of Dean’s necktie. The silk tie is very slim with wide burgundy, blue, and forest green stripes in the American direction from the right shoulder down to the left hip. This tie shows up two other times in the film: with a suit for the funeral finale and in a continuity error with the brown sport coat. Dean also wears his usual accessories in the scene, although barely seen since they’re both on his left hand and his left hand spends the majority of this scene in his pocket. There is a bracelet on his left wrist and a silver ring on his pinky. Dean is only filmed from the socks up in this scene, so he is either not wearing any shoes or he is wearing the same black leather oxfords that he wears with his gray suit in the finale. Although we don’t see his shoes, we do get a glimpse of his black silk dress socks when he is lounging in the hotel room before Duke’s arrival. Naturally, the stress of meeting with a gangster after a multi-million dollar casino robbery can only be alleviated with a stiff drink. In this scene, Dean wisely pours himself a glass of Scotch, neat. The Scotch actually appears to be a late 1950s bottle of The Macallan. While Dean was most typically seen indulging in J&B (including in this film! ), no man in his right mind would turn down a glass of single malt Macallan. If you’re going to drink, drink with friends. Especially if those friends are fellow Rat Pack members. Alright, so you’ve got a cool drink in your hand and you’re relaxing in a Vegas hotel room with your pals… what’s next? Music, obviously. 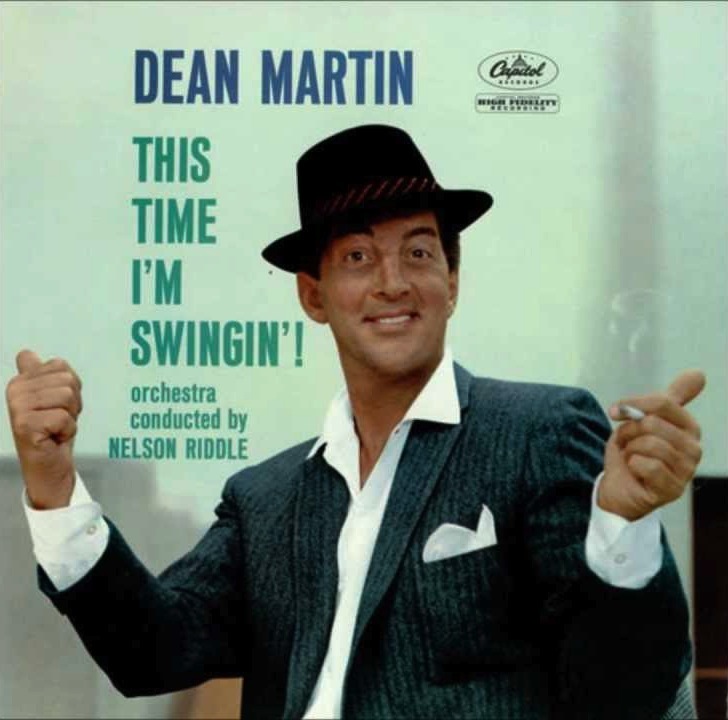 And what better music would accompany three swingin’ fellas (not in the weird ’70s way with mustaches and robes) than Dean Martin’s 1960 album This Time I’m Swingin’! This Time I’m Swingin’! was recorded over three sessions at Capitol Studios in Hollywood just after filming had wrapped on Ocean’s Eleven. Dean sports a blue striped flannel sport coat on the album cover that looks exactly like the one worn for this brief scene in the film. …despite the tragic abundance of current songs with lyrics like “pop ‘dat pussay”, which are released these days without a second thought. “Ain’t That a Kick in the Head” is featured in the film when a tuxedo-clad Dean sings and plays piano along with vibraphonist Red Norvo. I’m sure Dean Martin was swinging long before this album. The album is perfect for mixing up highballs while entertaining a late night guest or just enjoying a summer cruise in the car with the windows down. Dean manages to add a refreshing twist to the standard classic outfit of a blue sport coat and gray trousers. Check out the movie . The album This Time I’m Swingin’! is also a must-have for Dean Martin fans. Hey pallie, likes how absolutely cool for the second year in a row to homage our style icon Dino with a fabulous fashion post in honor of the day of his descent to earth…..the day that coolness came to earth. Know that your efforts are bein’ shared this day with all the pallies gathered ’round ilovedinomartin.